The other day I went to the store quickly to pick up some groceries. I knew I ate my last Pineapple Chobani so I went to the yogurt section to get some more. to my surprise… NONE LEFT. WHAT!?! What was I going to eat now!? So, I had to pick something else to fill my greek yogurt void. I saw something new that I never tried before, or even seen before really. 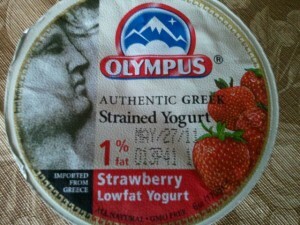 Olympus Authentic Greek Strained Yogurt – I bought one in the 1% Fat Strawberry Low Fat variety. According to the container, this yogurt is “imported from Greece”, as well as “all natural” and “gluten free”. It was thick, but not too thick, and had more of a fluidy consistency than other greek yogurts I have tried. It was sweet, with an amazing strawberry flavor, just the right amount of tang, and really no tart flavor at all. There were tiny pieces of strawberries in the yogurt as well as the occasional seed. I noticed I needed to drink water when I ate this, for the flavor was really quite powerful. Overall, 4 1/2 stars. If I had to say what it really reminded me of, it would be a strawberry smoothie, but in cup form. Delicious!! What’s your favorite food thats “Greek” or from Greece? 6 ounces is 155 calories, 2 grams of fat (1 saturated), 23 grams of carbohydrates, .31 grams of fiber, 22 grams of sugar, and 12 grams of protein.